Taking care of your tires means more than keeping up with air pressure checks and tire rotation schedules. It also means getting wheel alignments done every couple of years. Also known as tire alignment services, the frequency may vary depending on your driving habits or vehicle type. For example, heavy commuters, those with sporty vehicles, and vehicles with wider tires are often recommended to have the wheel alignment service performed once a year. A key clue that you need this type of automotive service is if your vehicle pulls to the left or the right even when the steering column is centered. After you rule out air pressure and regular tire rotations, it can be a sign that your axle and suspension needs adjusting. Another indicator is if your tires are wearing unevenly, most often on the outer rims. What exactly is a wheel or front-end alignment? 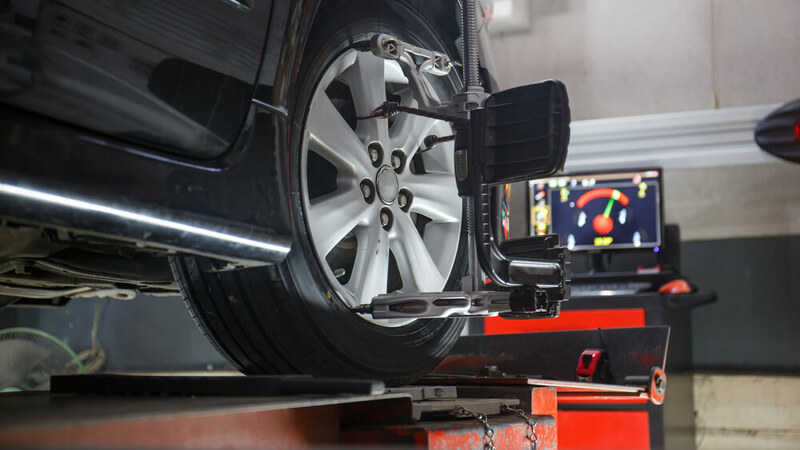 Often confused with a tire rotation, a wheel alignment service is a much more complex service. Tire rotations involve moving the tires to a new location so that the tires with deeper treads are in the rear for improved road grip and handling. While this is part of regular car maintenance, it does not address the axle placement and vehicle suspension. Wheel alignments are the process of making sure that your axles and wheels are parallel to each other and to the ground. If any of these are off by mere degrees, it affects how your tires wear and how long they may last. You may notice more difficulty in how your car handles and your ability to stay centered in your steering column. In fact, sometimes the steering column may be tilted even when in a “neutral” position. What do you need to do to alignment my axels and suspension? When you bring your vehicle to our Phoenix auto repair shop, our experts will take it into the bay and use a clamp-like device and attach it to the front wheels. This clamp serves as a feed to the computerized device that precisely measures the existing suspension angles of your wheels and axles. This includes the toe, thrust, camber, and caster. These components are ultimately the ones that influence your tire’s movements and position when you are driving straight and making turns. Those measurements are compared to your manufacturer’s standard alignment angles, and a printout is ready for the results. Your mechanic reads this and makes manual adjustments to each component as needed to ensure your alignment meets your vehicle’s standards. The computerized test provides the necessary information to recalibrate your wheel positioning and steering column to be as straight as possible. Why is it named differently based on my vehicle’s type? The suspension and positioning of the axles are different for front-end and four-wheel drive vehicles because some vehicles have independent or adjustable rear suspensions. This makes the vehicle easier to handle in different road and weather conditions. If you have an all-wheel drive or front-wheel drive vehicle, you will get a four-wheel alignment. A qualified ASE-certified mechanic will make sure that both axles are in the right alignment. Front-end alignments only need the front axle components to be adjusted. Also known as a thrust angle alignment, the process of correction ensures that your rear wheels point relative to the car’s center. The goal is that your rear axle is parallel with the front axle and is perpendicular to the centerline of the car. Having a tire alignment service performed as recommended by your manufacturer guidelines or mechanic’s advice helps your tires to last longer, prevent uncontrollable lane drifting, and ultimately, helps you prevent accidents. If you compare a $60-80 service charge to the high cost of replacing your vehicle, it’s clear that a small fee pays off in the long run. At Kelly Clark Automotive Specialists, we recommend this car repair service to be done by ASE-certified mechanics. We make sure each of our mechanics is ASE-certified and take part in continuing education to provide you with the best service and value possible. We also provide you with a printout of what your car alignment was like before the service and after the service, so you can visibly see the changes contributing to a safer driving experience. To learn more about our wheel alignment service options, contact our Phoenix-based car repair shop today. You can also schedule your service online!